The global engineering plastic compounds market was valued at around US$ 190.0 Bn in 2017 and is anticipated to expand at a CAGR of around 8.0% from 2018 to 2026, according to a new report published by Transparency Market Research (TMR) titled ‘Engineering Plastic Compounds Market – Global Industry Analysis, Size, Share, Growth, Trends, and Forecast, 2018–2026.’ The global market for engineering plastic compounds is driven by rise in the demand for these compounds from automobile component manufacturers. The engineering plastic compounds market in Asia Pacific is expected to expand at a CAGR of above 8.0% during the forecast period. Increase in the demand for lightweight automobiles and growing awareness regarding adoption of electric vehicles in the region are likely to drive the demand for engineering plastic compounds in Asia Pacific during the forecast period. Engineering plastic compounds is a group of compounds with superior physical properties that enhance their performance for extended use in structural applications over an extensive range of temperatures, mechanical stress, and challenging physical and chemical environments. Engineering plastic compounds have light-weighing properties and they are widely used in automotive applications. If the weight of a modern car is reduced by 100 kilograms, its fuel consumption can be lessened by approximately 0.2 liters per 100 kilometers, which ultimately reduces CO2 emissions by around 10 g/km. Thus, weight reduction in automobiles results in enhanced fuel efficiency and performance. 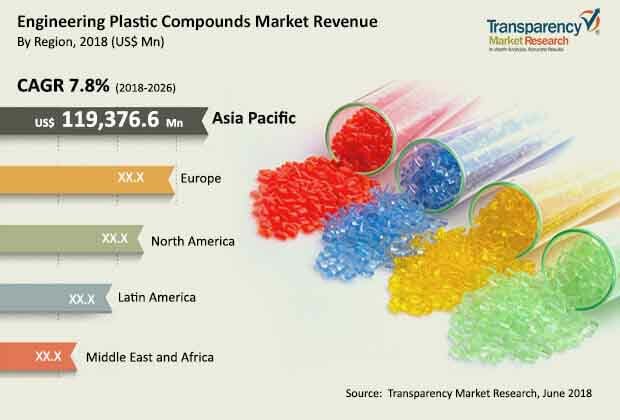 Increase in the demand for pollution-free vehicles and light-weight automobiles is expected to drive the global engineering plastic compounds market during the forecast period. Engineering plastic compounds are replacing metal components in major automotive and industrial applications. Engineering plastic compounds are primarily used in applications such as stress mechanical components, low-friction components, heat- and chemical-resistant units, electric components, housings, transmission applications, and building & construction applications. These compounds possess self-lubricating features that are suitable for automotive applications such as gears, radiator fans, radiator grills, instrument housings, speedometer gears, fuel & oil filter housings, electrical junction boxes, front fork bushes, and steering column bushes. A few of the engineering plastic compounds such as PC, POM, and ABS offer rigidity and dimensional stability to output components, thereby exhibiting outstanding resistance to high-temperature ageing. These compounds are suitable for high-temperature environments in electronic and industrial applications. Rise in the utilization of engineering plastic compounds in various end-use industries led by their versatile properties is projected to drive the engineering plastic compounds market during the forecast period. In terms of region, the global engineering plastic compounds market can be segregated into North America, Europe, Asia Pacific, Latin America, and Middle East & Africa. Asia Pacific constitutes a significant share of the global engineering plastic compounds market. China is the leading consumer of engineering plastic compounds in the region, as it is a major manufacturing hub for automobile and electronics industries. Rapid industrialization in developing economies such as India, South Korea, Thailand, and Vietnam is expected to boost the demand for engineering plastic compounds in the next few years. The market for engineering plastic compounds in North America and Europe is projected to expand at a moderate pace during the forecast period. Key players operating in the engineering plastic compounds market include Asahi Kasei Corporation, BASF SE, Celanese Corporation, Covestro AG, and RTP Company. Other prominent players are AKRO-PLASTIC GmbH, Daicel Polymer Ltd., Eurostar Engineering Plastics, Formulated Polymers Limited, Ginar Technology Co. Ltd., HDC HYUNDAI EP COMPANY, KAWASAKI SANKO KASEI Co., Ltd., Ngai Hing Hong Company Limited, Piper Plastics, Inc., Polymer-Group, Polyplastics Co., Ltd., Ravago Americas, Teknor Apex, Trinseo LLC, and WITTENBURG GROUP. These players are focusing on backward integration by expanding their business across the value chain in order to gain market share of the engineering plastic compounds market.